An Intergalactic Green Thumb Adventure! In this exciting adventure you must transform a dull boring world into a vibrant and lush world that is filled with beautiful flowers. But is this game worth checking out? Keep reading to find out! You must work your way through a massive world map by playing levels and collecting coins, seeds, etc. Gnomes block many paths and you need to use the stars that you've earned in each level to pacify them. 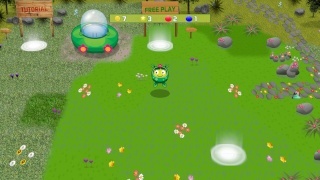 In the various levels you must collect and shoot pollen at the correct colored plants in order to cause them to grow and you need to keep feeding them or they will die and you'll fail the stage. There are also special flowers that require you to combine two different colored pollen to feed them which adds to the challenge of the game! If you shoot pollen at several same colored pollen you can create bubbles that can create flowerworks if shot which are import in scoring big in the stages! 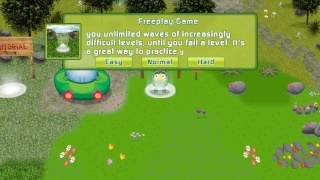 The game also features a free play arena that allows you to play a neverending wave of stages that become increasingly difficult and you must try to beat as many stages as you can before failing. You can also play together with a friend to breeze through the stages if you wish to do so and it really adds alot to the game! The controls are very responsive and more importantly are easy to learn and the Off-TV use of the Gamepad works well for this game! Flowerworks HD has a glossy shine that the WiiWare version of the game was lacking. The colors are extremely vibrant once you restore parts of the world and each of the 50+ stages have different background images that are quite detailed! 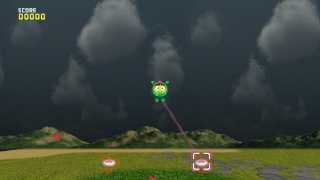 The special effects are flashy yet simple while the character models on the world map utilize a nice combination of cell shaded 2D sprites and 3D polygons giving them a unique look. The in-stage graphics have a more polished look and the game rarely ever experiences frame-rate issues. The music is sublime and fits the game like a glove! Though there isn't a large variety of tracks they are all quite exceptional. The sound effects are simple, but that works well with the simplistic gameplay of Flowerworks HD! With fun and addictive gameplay and good use of the Wii U Gamepad Flowerworks HD is a cut above most Wii U eshop titles and with nice visuals and a fitting soundtrack the game won't disappoint in-terms of its presentation either! And at $6 we highly recommend this game to any Wii U owner out there! Our review of Flowerworks HD is now live! please enjoy. $6 is a bargain for the amount of content this game has! @ReverseInverse thanks for the positive feedback! This is such a fantastic game! I downloaded this last week for $3.50, but even at $6 I would download this game in a heartbeat. I enjoyed the WiiWare original, but I might double dip for the enhanced audio and HD graphics. Good review. I'll probably dl this game soon. Such nice review. When come to Japan?